Unless you’re a dental professional – you probably haven’t heard most of these mistakes before. You may have decades of experience brushing teeth with no dental issues – but I’m willing to wager you are making at least one or more of these mistakes. As a dental hygienist, I see these mistakes every. single. day. With consistent use (twice a day for seven days a week) – the average life of a toothbrush is about three months. After about 200 uses – you need to switch your brush because the bristles are bound to be worn out and frayed. Our enamel is stronger than bone and really gives those nylon bristles a beating. Frayed or broken bristles won’t clean your mouth properly around the gums. Change your toothbrush once the bristles lose their flexibility, not when it looks like a palm tree. After a couple of months of daily use – bacteria and food particles begin to accumulate on the toothbrush too. Make sure you are changing your toothbrush every three months. Two minutes is the recommended duration for a tooth brushing session. 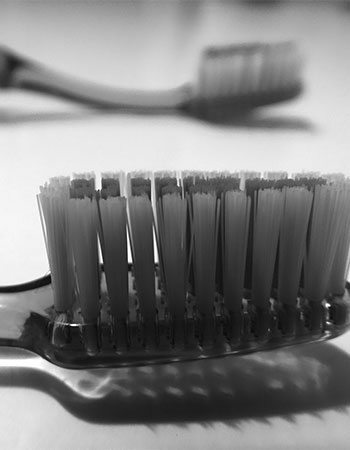 The average person’s brushing time is ONLY 36 seconds! Anything shorter than 2 minutes doesn’t properly get all of the surfaces of your teeth. When I switched to a Sonicare – an electronic toothbrush with a timer – I was surprised at how long the two minutes felt the first time I timed myself. Obviously, I had been brushing my teeth for less than the recommended two minutes. We are routinely missing out on clean teeth by cutting short our brushing time. Often – parts of the mouth get neglected. You may have pearly whites in the front – but what about the sides of the teeth or those in the back of your mouth? I recommend electronic toothbrushes with timers to help you go the distance. If you don’t have a timer, use a stopwatch or your phone. Use what you can to ensure you brush your teeth for two minutes. Yes – don’t rise your mouth with water after brushing your teeth. You can spit the toothpaste out, but the moment water enters the mix – it cuts down the efficiency of the fluoride from your toothpaste. Some of you will want to rinse your mouth out of habit. Use a mouthwash or mouth rinse that contains fluoride instead of water. Rinse, gargle, spit out the mouthwash and that should be enough. But don’t use water. Wait at least half an hour after brushing your teeth to drink water or consume beverages. We are all probably guilty of making this mistake. I recently read a study that talked about how more than half of the toothbrushes in households have bits of human feces on them. How did it get there? Because you store it in your bathroom. When you flush your toilet – the contents of your toilet bowl are sprayed in all directions. This is all the more relevant if you share your bathroom with others – especially with kids around the house. Putting a lid on your toothbrush helps reduce this issue. Consider storing your toothbrush someplace other than your bathroom – like on your nightstand or inside your medicine cabinet. Oh, and don’t forget to close the lid on your toilet seat before flushing. If you don’t already – make it a habit to start flossing daily. Flossing is required at least once a day to remove plaque between your teeth, where your toothbrush doesn’t reach. Plaque that is not removed through brushing and flossing turns into hard calcified deposits on your teeth. Set up a system so that you’re getting into those difficult areas between your teeth – a haven for bacteria thriving on food bits. I always floss at the end of the day. The hardest part is getting started. Aim to floss at least one tooth. Once you get going with one – it’s easier to floss the rest. 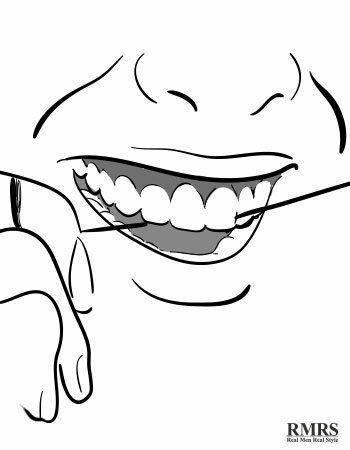 You can use the Individual flossing sticks or wrapping the long bits of flossing cord around your fingers. We don’t care what you prefer, as long as you do it! After brushing your teeth – clean your tongue to prevent bad breath and remove bacteria. A tongue cleaner scrapes the residual bacteria off your tongue. If you don’t want to do that – get a toothbrush that has a tongue scraper on the opposite side. You can also just use the bristles of your brush to clean your tongue after brushing your teeth. It’s not as good as a tongue scraper, but will get the job done. If the bristles are too stiff – they will hurt your gums. They will cause recession and tiny scratches in the enamel that leads to more stain and bacteria attached to them. Go for soft bristles. All you need is a brush to dislodge food particles that are stuck in between your teeth. You’re not looking to shine them to a buff. Brushes with medium or hard bristles used with some force can remove the protective enamel coating your teeth. This results in sensitive teeth and gums that hurt when you drink something cold. The correct way to brush your teeth is in circles – don’t go back and forth. Circular motions are more gentle and effective at cleaning the gaps between the teeth. The tooth brush should make contact with both the teeth and the gumline. Use a lighter touch, don’t press down too hard. Wide side-to-side strokes can scrape the soft tissue lining between your teeth and gums. Tilt your brush vertically behind the front and bottom teeth and use gentle rolling strokes strokes using just the front half of the brush. Avoid brushing so hard that the bristles bend on your teeth. Watch this video for the correct motions! You should always hold your brush at a 45 degree angle and make short circular strokes. That’s the angle for the most effective clean. Pointing the bristles at this angle guarantees superior cleaning beneath and above the gum line. Use the center row of bristles to clean between be the teeth and gums. Cleaning the gumline correctly avoids discoloration and more importantly – cavities and gum diseases. This is the reason why you’ll see some toothbrushes with angled bristles. Brushing teeth is something we do on auto pilot. We end up brushing the same areas and by habit – forget some other. Change things up by starting from a different area and following an irregular pattern. It will stop you from getting lazy by the time you get to the last bit of your brushing routine. The advantage of using an electric toothbrush is that you just have to guide it and it does a better job of reaching those hard-to-reach places in your mouth with less effort. There is no need to brush your teeth more than two times a day. Some people think it’s okay to brush three or four times a day – usually after every meal. My dentist disagrees. Brushing more than two times a day can actually damage your gums and erodes the enamel on your teeth and that’s not something that you want. If you brush multiple times, try not to use toothpaste except for morning and night. How Long Should You Wait After A Meal To Brush Your Teeth? Most people don’t wait after eating an acidic meal to brush their teeth. After eating – the pH levels in the mouth drop and your saliva has a higher acid content. Brushing your teeth can rub these acids deeper into the enamel of your teeth. You need to wait at least 30 minutes after a meal to brush your teeth. It takes about three weeks to learn a new habit. Include one change to your teeth-brushing routine every week. You’ll notice that your mouth feels fresher. Regular visits to the dentist and avoiding these teeth-brushing mistakes will ensure the long-term protection of your gums.